The Milwaukee Arena was the city’s major sports and entertainment facility when it opened in 1950. 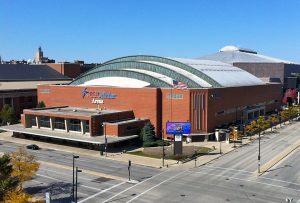 The Arena was home to Milwaukee’s first National Basketball Association team, the Hawks, and hosted events including the Tripoli Shrine Circus, Holiday on Ice, and orchestra concerts. 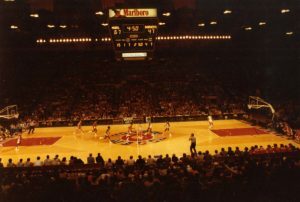 One of the nation’s first venues designed to accommodate television broadcasting, the Arena featured a boldly colored basketball court designed by Robert Indiana. 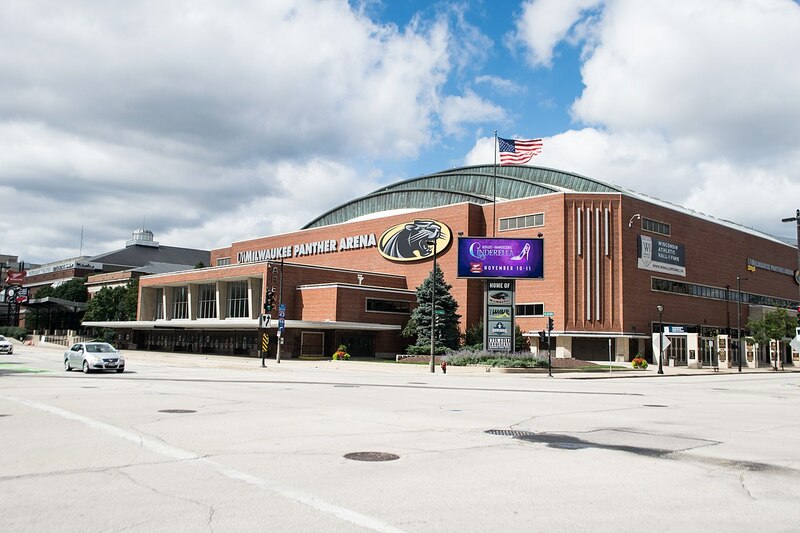 Over the decades, the Arena was home to the MILWAUKEE BUCKS and Marquette University men’s basketball teams, and the Milwaukee Does women’s professional BASKETBALL team, and hosted major rock concerts. Renamed the U.S. Cellular Arena in 2000, and then UW-Milwaukee Panther Arena in 2014, it is the home court of the UW-Milwaukee basketball team and since 2004 of the Milwaukee Wave professional SOCCER team. ^ “Timeline of Historical Milestones.” Wisconsin Center District, About Us, History, http://wcd.org/media/mediafile_attachments/02/92-facilitiestimeline.pdf, last accessed November 11, 2012. ^ “People,” Time, October 17, 1977. ^ “WCD Facilities Have a 100-Year History of Events.” Wisconsin Center District, About Us, History, last accessed June 8, 2016. ^ “U.S. Cellular Arena.” Milwaukee Wave.com, About Us, U.S. Cellular Arena, http://www.milwaukeewave.com/aboutus/uscellular/, last accessed November 10, 2012. Kertscher, Tom. Cracked Sidewalks and French Pastry: The Wit and Wisdom of Al McGuire. Madison: University of Wisconsin Press, 2002. McCallum, Jack. “In Your Face, Comrades!” Sports Illustrated, November 2, 1987. Porter, Karra. Mad Seasons: The Story of the First Women’s Professional Basketball League, 1978-1981. Lincoln, NE: Bison Books, 2006.